Well. We've had an odd few days, weather-wise. 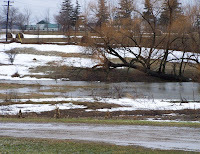 It got up to 9º C on Tuesday, and 11º C and plenty of rain on Wednesday... then fell off again to minus 2 on Thursday. So, we had some major flooding at Creekside. It was incredible. 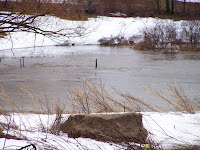 We had so much snow, and then most of it melted. Fast. It was kind of amazing to watch it disappear! These posts are from our former mess hall/storage shed/etc. It didn't survive through the 116km/hr winds we had a few times this winter. Sniff. But, you see the little white dots in front of the posts? That's the other set of posts... with water bottles on them. It's that deep. And yesterday, our yearly spring visitors made an early arrival. Rebekah saw them first, and was so excited! (You can see the water bottles more clearly in this picture. That's how fast it changes in one day!) And, that's fresh snow you're seeing. Sigh. I know it's only February, but I'm ready for spring! 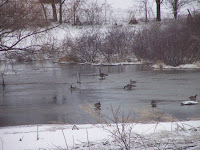 The geese are enjoying the pile of water! I think there's about 8 of them this year. That's hilarious! 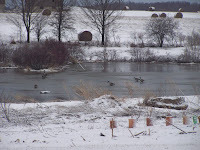 The picture of the geese walking on the ice, and then a few feet away another goose is a-swimming, that's just cool. They can either ice-skate, or go for a refreshing dip. Too bad about the hall, though. :( Is it salvageable? There's water in our basement, too, more than I've ever seen, but I think our basement is very well built. All the water travels down to the sinkhole, and the sump-pump throws it all away. I knew you would be flooded. I thought of you on Friday when I was driving around seeing all the flooded creeks. Hooray for geese!!! Spring IS coming! Hard to believe we'll be CAMPING down there in a few months.